Glenmorangie. Vale of tranquility or peace, depending on your translation. Could there be a more well-known single malt whisky brand? Possibly Glenfiddich, but this is certainly up there. Glenmorangie is owned by the Glenmorangie Company (which also owns Ardbeg Distillery on Islay and The Scotch Malt Whisky Society). Ultimately, however, it all falls under the umbrella of be Louis Vuitton Moët Hennessy, corporate luxury brand specialists, or “perfume peddlers”, depending on who you speak to, and certainly they seem to be unlikely operators of a vale of peace. Founded in 1843, Glenmorangie is based up in the Highlands and boasts the tallest stills in Scotland and is also one of the bestselling single malt whiskies, too. 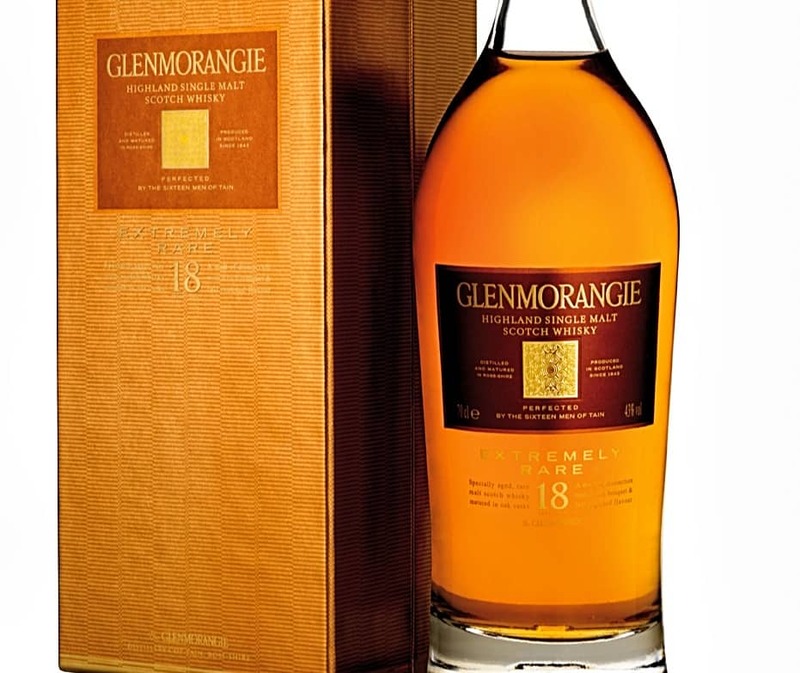 The Glenmorangie 18 Years Old is an interesting beast: matured for fifteen years in American white oak casks of which “approximately 30% is transferred into Spanish Oloroso casks to spend a further three years maturing”. After a total of 18 years, they’re whizzed back together and knocked out in bottles at 43% ABV (and around £90 to boot). Colour: somewhere between amber and almond, depending on the light. On the nose: butterscotch, ginger, blood orange, and the ever so slight waft of a bonfire. In the mouth: plum jam, maybe lemon marmalade, cinnamon, oaky. Fairly light weight on the tongue, and would be clean if it wasn’t for those gentle spices and heat. Mouth-watering. Not as sweet as I first thought it might be and a very bitter chocolate finish – which does linger quite a bit. The structure is good, but not hugely sophisticated. It’s good – but at getting on for £90 a bottle, I’d certainly be spending my money elsewhere. I can see the potential brilliance within; it just isn’t rocking my world, which it needs to do at this price. Ah yes, the mysterious realms of tea spooning to protect the original distillery and their brand as such. I’ve touched on this before when reviewing.. The Glenmorangie, oh woe is me. Chatting to whisky enthusiasts in North America its a very popular brand across the Atlantic along with Balvenie and..
It’s that time of year once again for Jim Murray’s summary on the whisky that was and what should be on your shopping list. An..